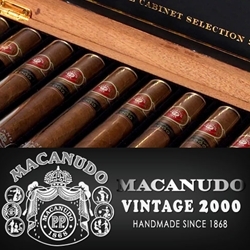 The Macanudo Vintage line has returned with a silky light brown Connecticut Shade from its Vintage Selection 2000 crop. Each of these hand-rolled premium cigars are packed full of Dominican (Piloto Cubano), and Mexican fillers. The binders consist of dark Mexican San Andrean, bundled up inside a blonde Connecticut Shade wrapper. Just one smoke from these handmade cigars will give your taste buds a smooth, rich bouquet of flavors, offering hints of cedar and toast. The Macanudo Vintage 2000 line is presented here in four classic sizes, each preserved inside their own glass tube. Want these elegant premium cigars delivered right to your doorstep? Smokers Discounts can make that happen! We’ve made it easy and affordable to buy premium cigars online. A variety of sizes and flavors are listed below. Each of these styles are in stock and available for a discount price! Call us for more details!